Low temperature cooking, increasingly known as sous vide cooking, has firmly established itself in haute cuisine due to the perfect, reproducible and aromatic results. Meanwhile, this method has made its way into other culinary areas. The reason for this is the compelling advantages of sous vide cooking and fusionchef: always perfect results, exact reproducibility and a low loss of food volume. For many years fusionchef by Julabo has been combining successful, professional temperature control technology with the art of cooking. Today acclaimed professional chefs from around the world swear by the sous vide method with fusionchef sous vide units. Consistent quality, smoother work flows and save on costs every day? With a bit of practice and use of high-quality products, sous vide cooking can ensure that your quality stays uniform through exact cooking times day after day. Do you want to stand out from the crowd by creating something impressively new? sous vide technology is not just for conventional cooking; it can also be used to create imaginative dishes with regional and exotic products. Sous vide cooking is very well suited for preparing a variety of high-quality dishes in larger quantities. A good lunch menu without a chef? The sous vide technique is the ideal solution for pre-cooking a lunch menu in larger quantities and good quality at a fixed time and then serving without a chef. The sous vide technique offers new possibilities for preparing infusions for mixed drinks and cocktails. High-quality catering that keeps costs and personnel under control? The sous vide technology is ideally suited for preparing high-quality, well-balanced meals for different target groups. fusionchef USA will be represented at "The NAFEM Show" in Orlando from 7-9 February 2019. This is a great opportunity to talk to our sous vide specialists. USA fusionchef Chef Ambassador Peter Barlow of Niteshade Chef Collaborative will be doing a sous vide steak with a winter roots foam, toasted yeast, and shiro-dashi. For me, this device is so absolutely useful, because I can always have it with me when I cater. It is super small and easy to transport. 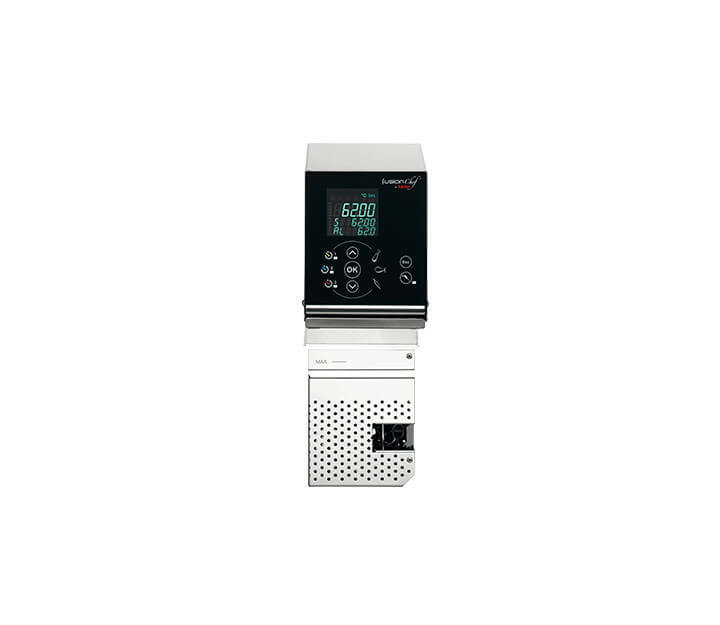 Can foods with the same cooking temperature but different cooking times be cooked in the same fusionchef sous vide instrument? fusionchef offers custom fitting separation grids for the XS, S, M, L and XL sous vide instruments in order to divide the water bath into sections. The cooking products can then be divided by time needed and easily identified to be taken out at different times. Ideal for starting with sous vide cooking. Recommended for restaurants, hotel restaurants, innovative chefs, caterers, public caterers and butchers. "Julabo is a company whose commitment to quality and precision has made them the leader in temperature control and an essential mainstay in my kitchens. ..."